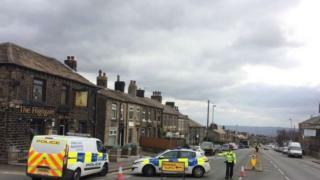 A man has appeared in court charged with murder after a fatal stabbing in Huddersfield. Richard Astin, 42, was found unresponsive on New Hey Road in the early hours of Tuesday. Police said he was taken to hospital, where he was pronounced dead. Shaun Waterhouse, 39, of Buckden Court, Huddersfield, was remanded into custody by Leeds magistrates. He will appear at the city's crown court on 2 April.